The Meadows Casino in Washington County decided to add another game to the 3,284 slot machines already in their building. 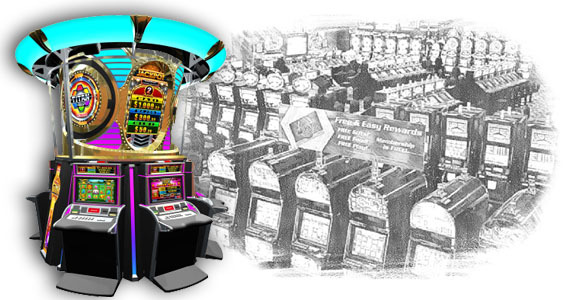 This isn’t your regular, run-of-the-mill type, but rather it is a giant compared to the rest of the slot machines. Known as the Titan 360, this large machine is 3-tons, 10 feet tall, and 11 feet wide; the name Titan is quite suitable for this behemoth. Although its size is impressive, the way the casino is using it is even more impressive. We all know that slots offer their regular jackpot, but the Titan 360 is in a whole other class. What this machine offers that others do not is simple, an infinite jackpot. Much like the progressive jackpots that we have come to love and desire, the Titan 360 offers its own personal jackpot with no limit. It takes every bet wagered, and adds a percent to the jackpot, and if no one wins the jackpot, it will simply continue growing. You could say that this is another way its name Titan, a giant mythological being, is a great way to describe this slot machine. On top of this great feature, it also has four different themes, eight seats, and an amazing bonus where players could win up to $10,000 on just a $5 bet. The Meadows Casino has a certain monopoly with this mega slot machine, seeing as they are the only casino to offer it in the tri-state area. So, if you are looking to play slots in the area, give the Titan 360 a shot.